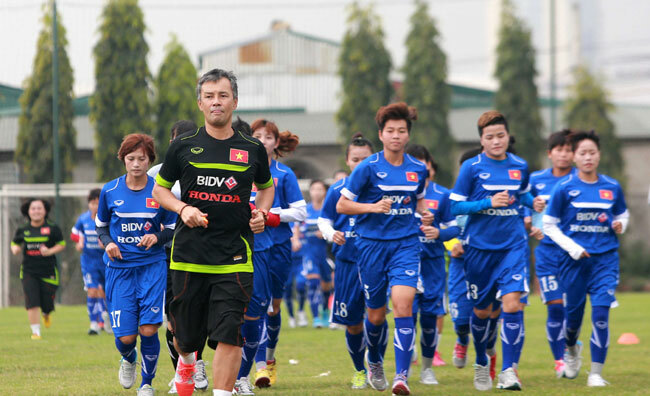 HA NOI (VNS) — Viet Nam hope to win the ASEAN Women's Football Championship starting on May 1 in HCM City. Coach Norimatsu Takashi, who has worked with the team for several weeks, is confident of retaking the trophy that they lost two years ago. He said he was surprised at the professional attitude of Vietnamese players who, he said, worked very hard, focused on his programme and quickly carried out all exercises. Myanmar and Thailand are powerful teams, so Vietnamese women need to be in top shape. Takashi said he was satisfied with their progress. He said Viet Nam had chances to go further, but needed time to build up into a really strong team. He said there was something similar between Vietnamese and Japanese women's football although there was a big gap between two teams in world ranking. Japan spent 20 years to become world champions with the support of many experts and foreign players. He said it would be the same for Viet Nam, who have to improve the quality of the national championship as well as create more competitions for them. Mai Duc Chung, head of the Viet Nam Football Federation's (VFF) National Teams Department, agreed with Takashi's goal. "The VFF has not set any target for the team, but as we play on home soil with many fans, we should get the best result," said Chung. After a loss of 1-2 to Ha Noi T&T's U14 men last week, the team, which arrived in HCM City yesterday, will have another match against the city's women's squad today. Takashi has 24 players in training. Many competed successfully during the Asian Games where they entered the semi-finals. The championship will kick off on May 1. Viet Nam will play Myanmar a day later. Both teams are considered at a higher level compared to Malaysia and the Philippines in Group B. They are expected to secure two berths to the knockout stage. In Group A, Thailand and Australia are expected to be semi-finallists as their rivals, Indonesia and Laos, are not as strong as them. Teams will compete in the May 1-10 event at the Thong Nhat Stadium.